“By God the old man could handle a spade/just like his old man.” In his poem, ‘Digging’, Seamus Heaney celebrates his earth-turning lineage but is resigned to his inability to emulate the footsteps of his father and his grandfather: “But I’ve no spade to follow men like them/Between my finger and my thumb/the squat pen rests/I’ll dig with it”. Moving away from his roots and into his writerly existence, Heaney is detached and divorced from the physical and manual essence of life. For him now, his writing is his digging; but Heaney has it wrong – writing and digging are not mutually exclusive, they are both elemental. And if you are a slave to the pen (well, the qwerty keyboard), there is nothing more essential to maintaining equilibrium than moving and breaking up the earth. Now that the harvest is complete on the allotment (save for the fennel, sprouts and leeks), the waning plants uprooted and composted, the last defiant weeds shaken from the soil, it is time to dig. Each bed is roughly dug, treated to a good covering of muck and then left uncovered to let the winter frost break the soil up even more. 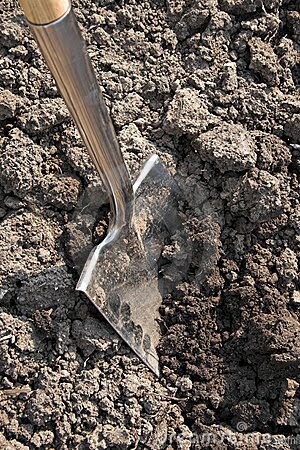 I enjoy the digging, turning over the soil in great spade-sized sods and if the weather is against me it is all to the good. Last Saturday, a benign drizzle was whipped into a cold shower by a capricious wind: the mild westerly of the day before had become a stiff north-easterly and, head down and hood up, I dug and dug hunched to the task. Lost in thought, and with the repetitive rhythm of moving up and down each row of the potato beds, I soon passed two hours before I noticed the afternoon light was fading. Breathless but invigorated, I had shaken off the cares of the working week and had set my mind straight on a tricky chapter. Today, the weather could not have been more different: a warm, low sun meant it was coat off and sleeves up and harder, sweatier work; but there was no less room for thoughtful reflection. Having come from the morning’s Remembrance Day service in Hailsham, where my sons were parading with their Beaver and Cub Scout troops, I was considering whether I would attend regularly if it wasn’t for them. And I’m sure I would, even though I never did before it became something my sons did. Remembrance Day is not only about marking the passing of those who were lost in the senseless slaughter of the First World War - it is also about the loss in all of the conflicts in our name since then; and it is a chance to acknowledge those who fought and have survived and those who survived but are no longer with us. The wars of the twentieth century still touch so many of us and, as I dug, I thought of my own connections: my dad, orphaned at 18 and in Lancaster bombers as a 22 year old, scared to death over Germany in 1944, an experience he never shook off; his mum, four years earlier, dead from injuries she received when she was blown across the room putting up a blackout curtain during the Blitz. My mum’s brother, also: a prisoner of the Japanese in Burma without having fired a shot and lucky to survive the cruelty and near-starvation. My mum said he was never the same when he came home and I have an early childhood recollection of seeing him before he emigrated to Canada in the late sixties, a stern but quiet man. And my maternal grandfather, who survived the Great War but came home with a leg full of shrapnel that put paid to his pre-war football career with Bury – and certainly to his mooted move to Liverpool that had been interrupted by Franz Ferdinand’s difficulties – and sent him back to the hard life of the railways. Drifting out of reverie, I am conscious again of the spade - “the curt cuts of an edge” – as it breaks up the roots of the long-dead sweet corn plants; but the digging has caused “living roots [to] awaken in my head”. I never met my father’s mother but she is no less of a “living root” to me than those who survived but were changed forever by their experiences. For Heaney, “the squat pen rests; as snug as a gun” but if I have to choose a weapon it is the spade, “the coarse boot nestled on the lug, the shaft/against the inside knee”, turning over what has gone before and preparing for what is to come.